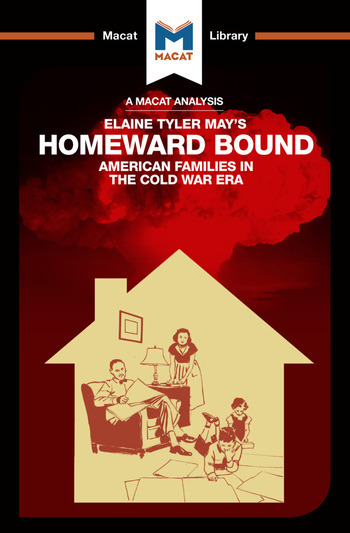 Elaine Tyler May’s 1988 Homeward Bound: American Families in the Cold War Era is a ground-breaking piece of historical and cultural analysis that uses its findings to build a strong argument for its author’s view of the course of modern US history. The aim of May’s study is to trace the links between Cold War politics and the domestic lives of everyday American families at the time. Historians have long noted the unique domestic trends of 1950s America, with its increased focus on the nuclear family, neatly divided traditional gender roles and aspirational, suburban consumer lifestyles. May’s contribution was to analyse the interplay between the domestic scene and the political ideologies of American government, and then to build a carefully-constructed argument that draws attention to the ways in which these seemingly disparate forces are in fact related. May’s key achievement was to use her analytical skills to understand the relationships between these different factors. She traced ways in which domestic life and US foreign policy mirrored one another, showing that the structures and processes they aimed for, while different in scale, were essentially the same. She then carefully brought together different types of historical data, organizing her study to produce a carefully reasoned argument that the American suburban home was in certain direct ways the product of the ‘containment’ policies that ruled American foreign policy at the time. Dr Jarrod Homer took his PhD in Sociology at the University of Manchester, with research focusing on American Culture and Jewish artists of the mid-twentieth century.